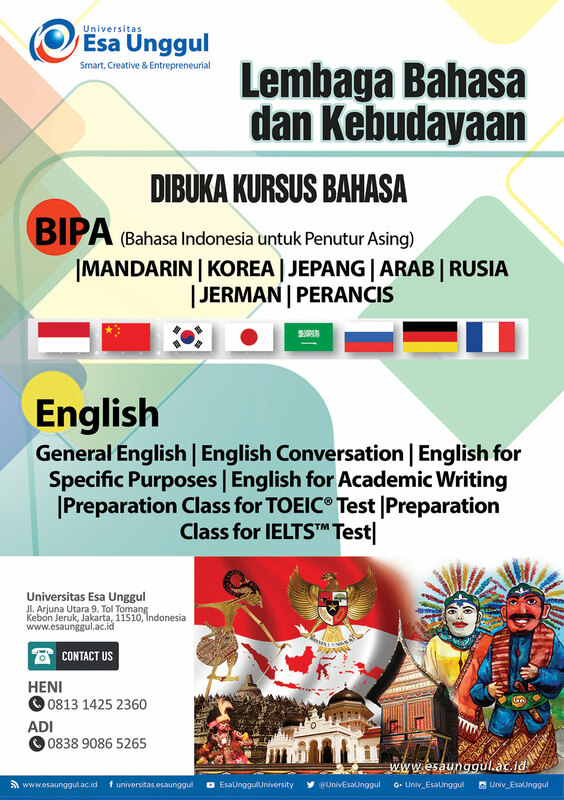 Esa Unggul as a university feels called to increase understanding of cultural and linguistic diversity at the local, national and international levels through the Language and Culture Institute. Rector of Esa Unggul University Dr.ir. Arief Kusuma, M.B.A said that aside from being used to learn various languages and cultures, the establishment of this institution is a form of Esa Unggul as a world class university. To become a quality, adaptive and responsive language and culture institution to answer the need for increased communication skills and cultural development in order to support Esa Unggul University to become a world class university. Provide quality language learning with competent resources. Organizing standardized institutional, national and international language tests. Develop capabilities that support learners to be able to interact orally and in writing. Mastering cultural knowledge and fostering cultural awareness to participate in global communication using target language. Local and International Cultural Festivals.